Because quitting would instantly make him filthy rich. If you quit your job right now, you'd probably get a farewell party, one last paycheck, and the contents of your 401(k). Unless, of course, you happen to be a CEO. In 2011, the average S&P 500 CEO could expect a $22 million golden parachute upon leaving office, according to GovernanceMetrics International data reported in Forbes. You'd expect the notoriously self-rewarding banking sector to exemplify these cushy paydays. But many of the biggest banks proudly and publicly scorn severance packages. 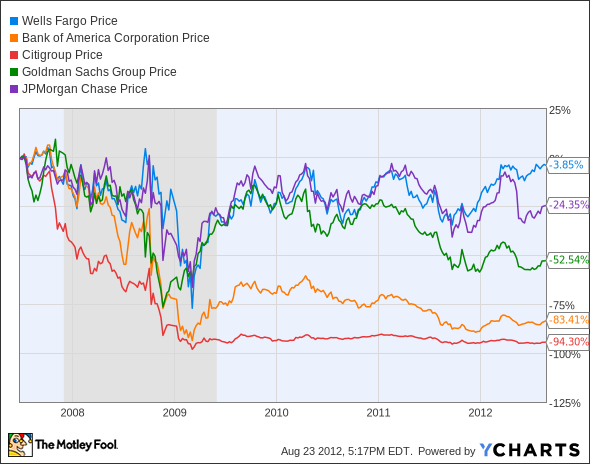 However, one very big exception persists -- which could bode poorly for investors in a popular, thriving bank stock. Banks? Being classy? We're as surprised as you. 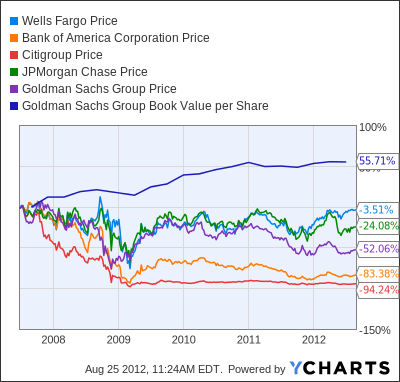 Source: Respective companies' 2011 proxy statements. Don't expect all of those gravy trains to continue. Goldman, B of A, Morgan, and Citi all spurn executive severance pay. And all five of these companies link the bonus pay of their top brass to clawback provisions, which repeal some portion of their rich rewards if their current business decisions prove dire. Few will leave their jobs empty-handed, though -- unless, in some cases, they're fired "with cause" for doing something illegal. Many have previous stock grants, company-provided life insurance payouts, and/or sizable pension benefits. Here's a quick rundown of what the heads of Goldman, B of A, JPMorgan, and Citi stood to gain in fiscal 2011, based on various terminal scenarios. Much of what you'll see comes from stock grants; unless the employee dies, those grants are all subject to clawbacks. *Possibly. The amount he'd get upon being fired with cause would depend on the board's discretion. $1.92 million from a supplemental 401(k) plan. $751,168 from a "cash balance plan" pension. $21.46 million from a "supplemental cash balance plan" pension. The final total: More than $24 million. On top of all that, Stumpf could eventually get as much as $34.42 million worth of as-yet-unvested stock rewards if he retires or quits. If he dies, is permanently disabled, or gets ousted in a buyout, he'll receive a smaller guaranteed payout of a mere $20.34 million for that stock. Following his departure, Wells Fargo also guarantees Stumpf office space, his own assistant, and a part-time driver for two years, in exchange for consulting for the company. Still, when he's guaranteed to reap millions no matter what he does, what kind of long-term incentive does Stumpf have to best serve shareholders' interests? Even if Wells Fargo needed to claw back every penny of his pending stock grants, he'll still leave with a gargantuan check. Fools, you can easily find proxy statements through the SEC's Edgar search engine; just look for DEF 14A forms. Read them carefully, and look hard at any company whose leaders reap rich rewards, regardless of their records. Admit it -- you might not work quite as hard if you knew you'd get rich regardless. Why should CEOs act any differently? If Brian Moynihan's benefits as Bank of America CEO piqued your interest about the company, we've assembled an in-depth look at the challenges and opportunities awaiting one of the nation's biggest banks. Discover everything we've learned about Bank of America, and get a full year of updates to our initial findings, by checking out our special report.